Supermajors are taking on more renewable energy commitments lately as they prepare for a less carbon-intensive future. Some of them are going a step further, coupling these green commitments with humanist causes such as providing access to energy to part of the one billion people all over the world who have no electricity. Power for All director William Brent reviewed in a recent story this push that will see Shell, Total, French Engie, Schneider Electric, and others of their caliber build electricity supply from clean sources for 200 million of this one billion within the next 10 years. Shell is the most ambitious, aiming to provide access to electricity for 100 million, and Total plans to provide 25 million people in Africa with solar energy derived power within the next two years. Others are also catching up with the green agenda. Exxon recently announced it had inked a 12-year deal with Danish renewable energy company Orsted to buy 500 MW of electricity produced by solar and wind farms to power its oil production in the Permian. The deal reflects falling renewable energy prices, which is making renewable energy a lot more competitive with fossil fuels, not to mention the reputational effect its deployment would have on Big Oil– and Big Oil is in serious need of news that is good for its reputation. Even with a redoubling of efforts to move more quickly into renewable energy territory, challenges remain, however. Shell and BP, for instance, are being pressured by activist shareholders into doing more to lower their carbon footprint. One such activist shareholder, Dutch group Follow This, has been actively pressuring the companies it holds shares in to be more active in carbon footprint reduction work. Shell’s dealings with the group, whose sole purpose for owning shares in oil companies is to apply the above-mentioned pressure, are a case in point. A recent Bloomberg report said Follow This will once again, for the fourth year in a row, present at Shell’s 2019 AGM, a resolution seeking to force the company to move its business goals closer to Paris Accord commitments undertaken by more than a hundred countries. Shell has been Follow This’s first target, and the resolutions, although invariably beaten down by other shareholders, have had an impact and Shell has clearly undertaken more commitments in the cleaner energy transition area. But Follow This is not stopping with Shell. Its resolutions have been garnering growing support despite their failure at the shareholder votes, and the group is now setting its sights on other sector players. 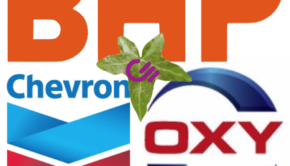 BP is facing a resolution of its own with the same call to action, and, according to the group, Chevron and Exxon may also join Shell and BP in case no other shareholder beats Follow This to the resolution tabling line. So, Big Oil is doing more, but it’s nowhere near enough and the latest climate talks in Poland suggests pressure will continue increasing on the industry. Governments met in Poland to devise a rulebook for implementing Paris Agreement commitments, but doing this has turned out to be trickier than maybe some expected. As per a BBC report on the topic, there are too many factors to contend with while deciding on the best way to arrest the warming of the atmosphere. Yet one thing is certain: fossil fuel producers will continue to be in the focus of attention as the biggest culprits behind climate change whatever they do to move into renewables and cut their carbon footprint. After all, whatever they do, until the world doesn’t need oil, oil will be produced.